Walking in the Spirit is a lifestyle, It means choosing to seek guidance for every decision from the Holy Spirit instead of our flesh. It’s telling our flesh to sit down and shut up while we bend our ear to hear the still small voice of the Spirit telling us which way to go and what choice to make. It’s asking the Holy Spirit on a moment to moment basis to guide us to the right choice that will please God and not our flesh. It’s that daily dying to self and picking up our cross to truly follow Jesus. For this healthy journey to be successful, I must rely on the Spirit of God to guide me. My flesh is like a little kid in a candy store that wants everything and will throw a tantrum if she doesn’t get everything! I want to do right and I make right choices in my mind, yet more times than not I choose to gratify my fleshly desires, why? 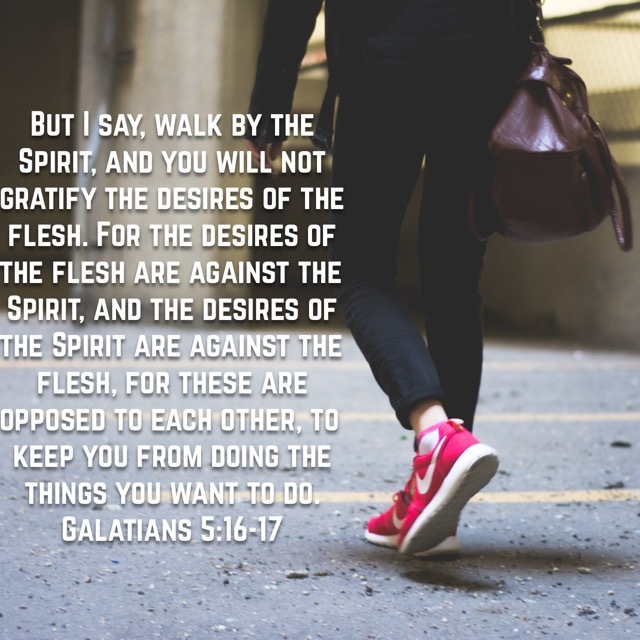 Well the verses above tell me why – “For the desires of the flesh are against the Spirit, and the desires of the Spirit are against the flesh, for these are opposed to each other, to keep you from doing the things you want to do.”. So you see I must walk in the Spirit otherwise my flesh will keep me from doing the things I want to do. I want to be healthy and that means making new choices, so each day I am asking the Holy Spirit to teach me to walk in Him and allow Him to guide my every choice today and tomorrow and the next day, etc. So I say to my flesh, sit down sister and be quiet because I can’t hear the still small voice of the Spirit when you are throwing a tantrum! Today was a good day, I was able to overcome temptations and make good choices. I praise God for that and know that it is vital to this journey that I remain walking in the Spirit every single day!